With the holidays officially over, I am happy to be back on a regular writing schedule. The last couple of weeks have been super busy, and I missed writing. 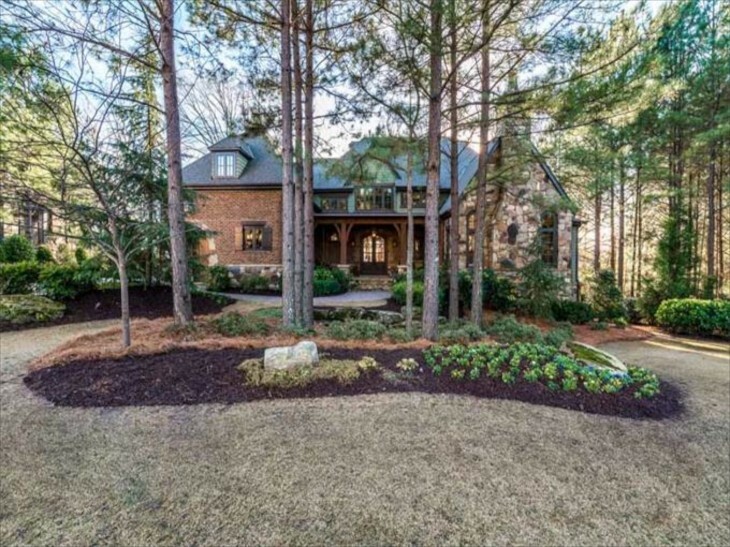 Today I have an elegant Lodge style home in an area just outside of Atlanta, Georgia in Suwanee, Georgia. 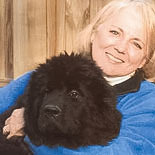 Built in 2009 it is large at 10,185 sq. ft. What I like about this home is that it has a very definite connection to the natural area in which it was built. Constructed of brick, stone and wood, it is truly “grounded” to its site. It has 5 bedrooms, and 6 1/2 baths, 6 fireplaces, 2 kitchens, library, 3 car garage, hand scraped wide plank walnut floors. Add to that 3 laundry rooms, a spa on the terrace level with sauna, steam shower, massage room, aerobics room, and work out room. To make it easier to navigate the home, there is also an elevator. 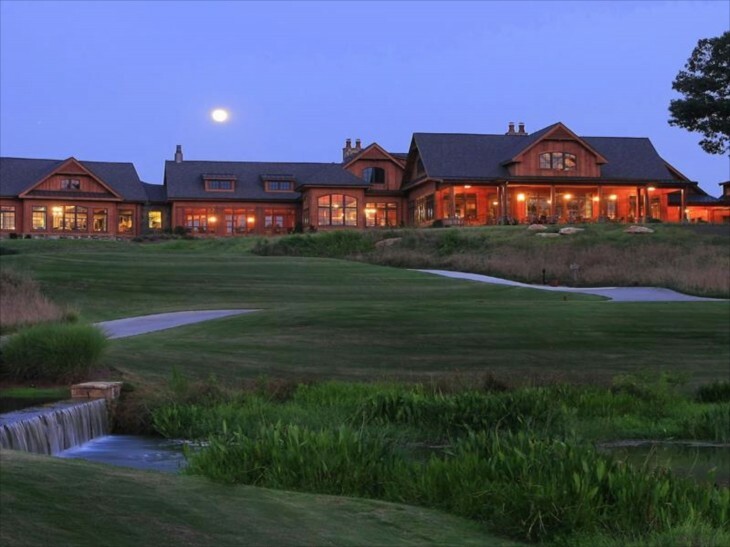 The home sits in an area called The River Club which features a clubhouse and a Greg Norman Golf course. If you are a golfer then you may not appreciate that I am not very fond of them if they use intensive chemical management of their courses. It seems somewhat at odds with homes designed and built with the intent to blend into their environment amid as natural a setting as possible. However, the home is beautiful, reminiscent of the Lodge style homes in the Adirondack Mountain region of New York State. Here they part a bit, as the homes like we see here have an elegance because they serve as mostly full time residences, whereas the home in the New York Mountains were mostly used only during the summers. Let’s take a look. On this frigid winter day, this home has elements, despite its size, that create warmth, and much of the US could use a bit right now. The setting is beautiful and quite welcoming. I have always liked a mix of stone and brick, and with the added timbers at the entrance, there is a visible solidity. The evergreen pine trees give all season color, movement and fragrance. In this bedroom there is enough room for a small chair by the window, always welcome. The room needs a touch of blue or a complimentary color somewhere else in the room. 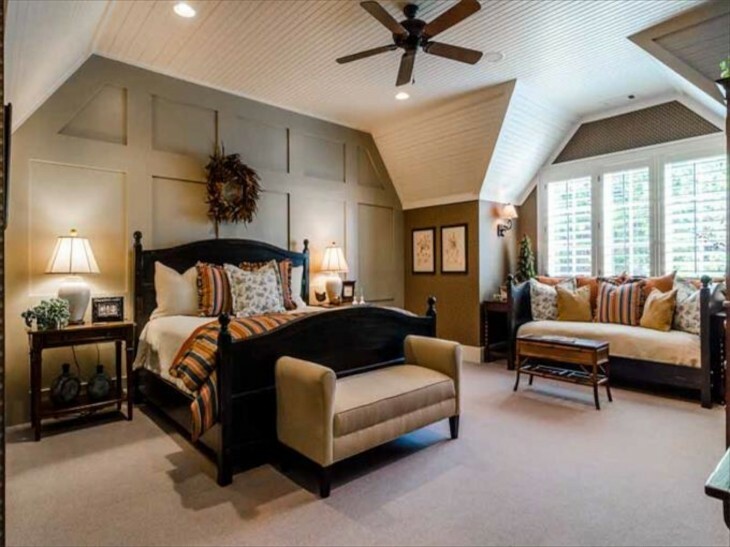 I like the board and batten color, but feel that the color of the ceiling is wrong for this room. 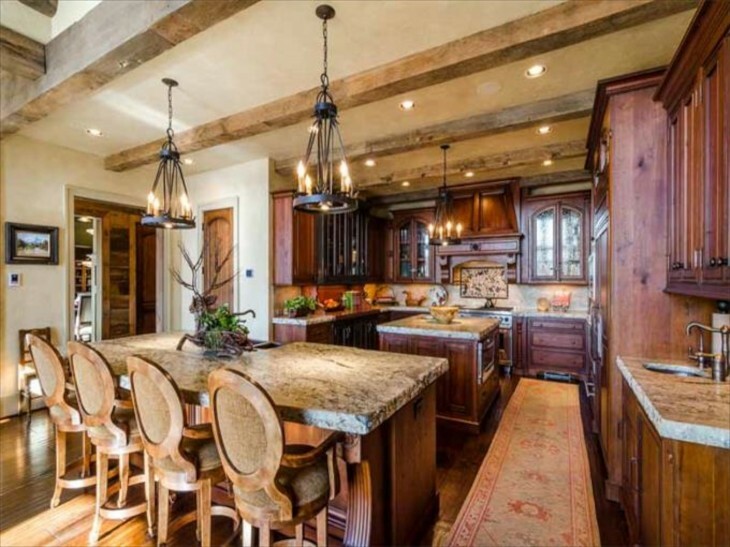 The beams add a lot of character to this kitchen, one of two in the home. I like the cathedral glass cabinet doors. I especially like the ones over the refrigerator/ freezer, not often seen. The countertops are thicker than average and again add a solid, luxurious presence in a home with strong architectural details. This library area overlooks the first floor. Notice the stepped trey ceiling in the hallway. With the lights and the color of the wood stain, it must look incredible cozy at night. 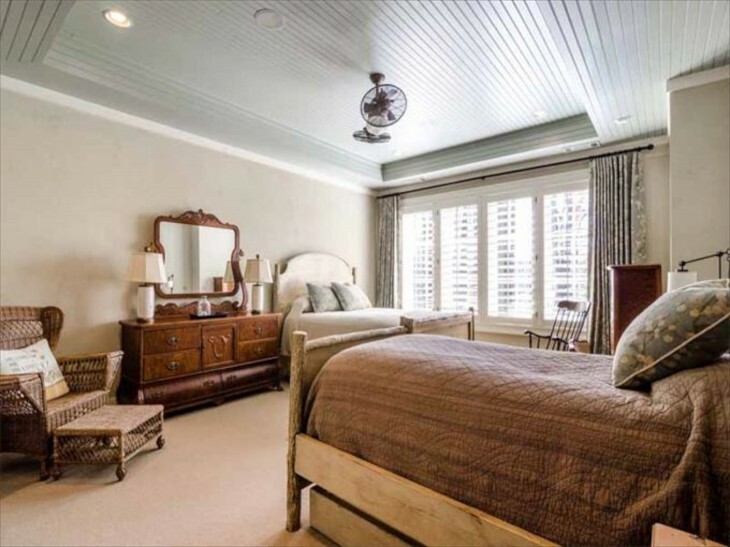 Here the wood paneled accent wall adds texture when combined with the bead board ceiling. The shape of the ceiling adds more interest. Because of the texture and color already in this room, the choice of a short, tight carpet weave is really nice. The day bed looks inviting tucked in the bay window area. Even though there is a lot of wood and dark colors, it is balanced by some lighter colored textiles. Even though there is a large amount of furniture in this bedroom, it still feels bright yet cozy. This is a wonderful example of using a dark color that does not make it feel closed in. I like how in this bedroom the beds were placed opposite each other. It allows the users to feel they each have some personal space in the room. 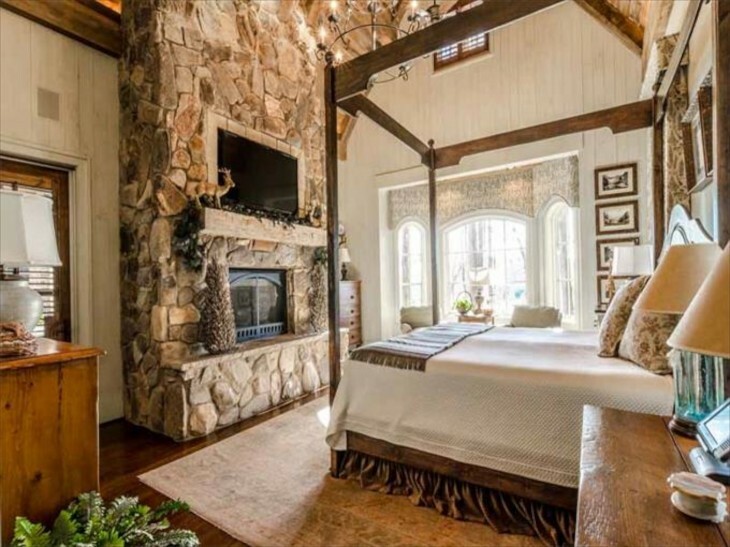 One of the master bedrooms with a raised hearth fireplace so that the fire is visible from the bed. The way they recessed the TV into the stone of the fireplace and framed by the mateo on the bottom, makes the TV almost disappear as a TV. 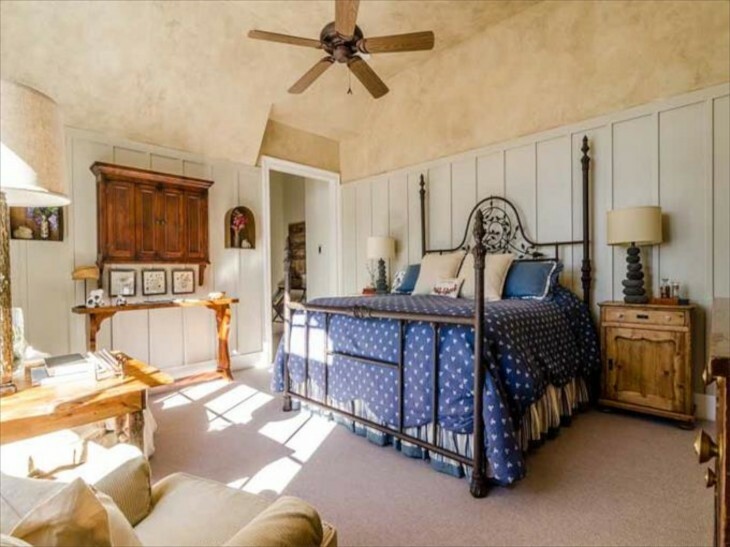 This bedroom almost looks like one you might find in a New England B&B. The iron candle chandelier is a nice finishing touch. 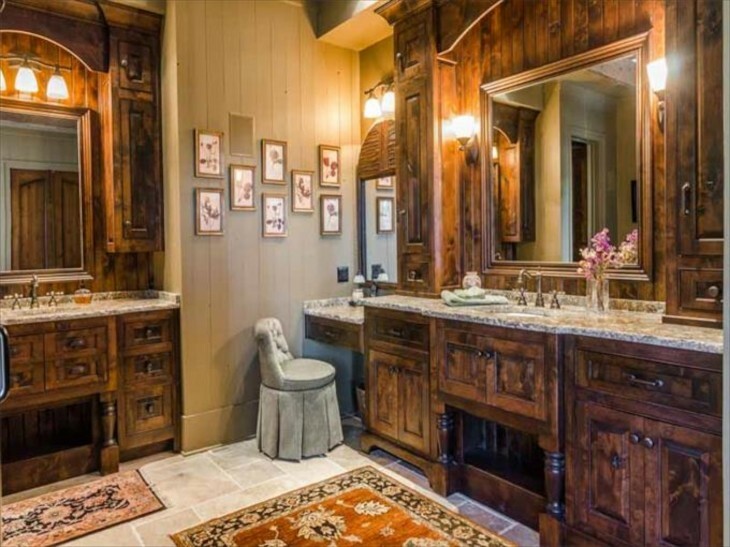 Master bath is luxurious even though it has some rustic tones. A longer view of the kitchen showing the second island. 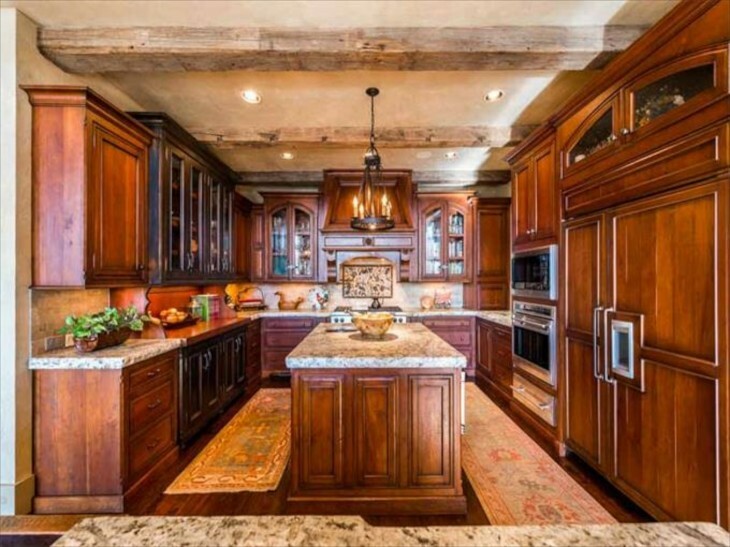 Although I prefer kitchens with their own windows, it appears that there are large windows behind the island in the foreground. 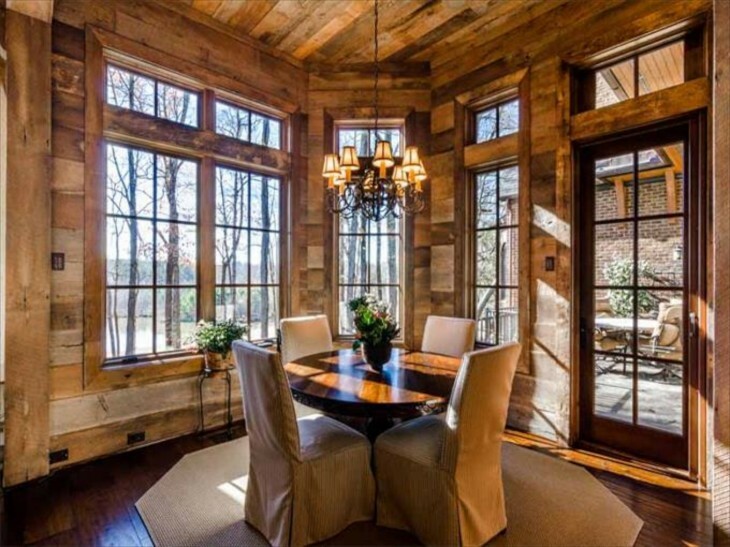 With multiple windows, light pours into the eating area. The clever use of boards to imitate the look of logs and chinking lends interest and character. The choice of neutral chair slipcovers in the same tone as the color of the “chinking” and area carpet ties one to the other. I couldn’t find a better photo of this living room, so this will have to do. 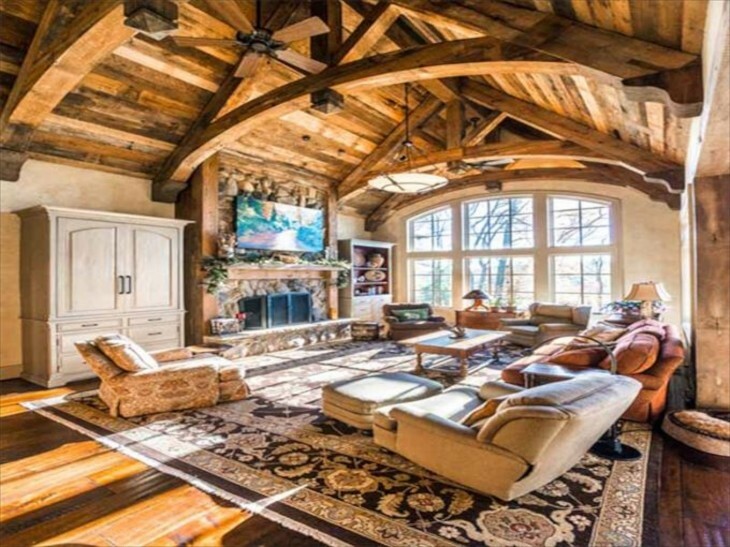 I like how the trusses mimic the top of the window. You can see how the light streams through the room by looking at the sunlight pattern on the floor. 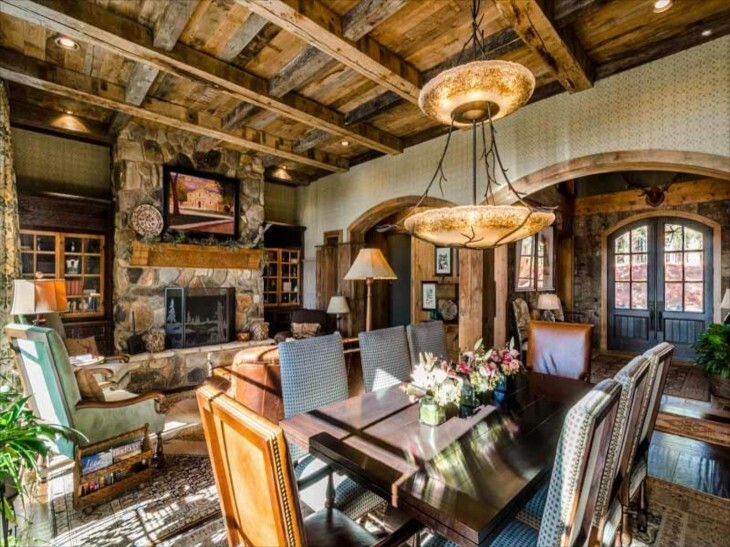 In this combined living/dining room we can see again that the sun brightens the room despite all the wood and stone. 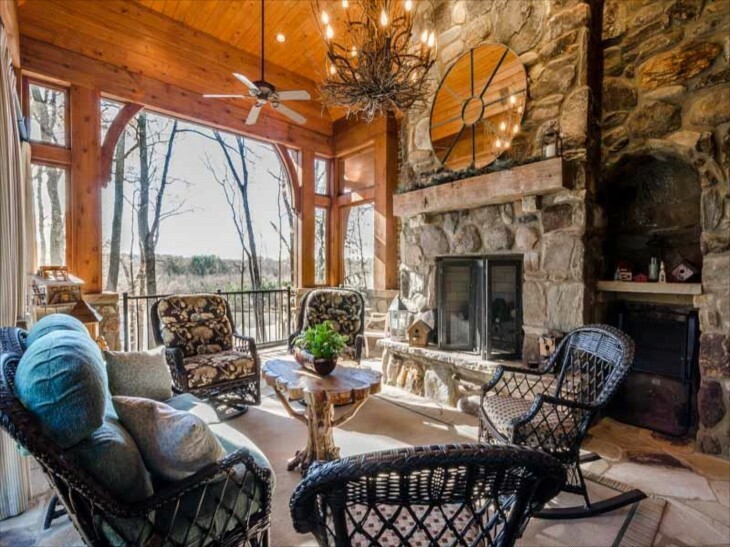 This covered outdoor area is probably well used, with panoramic views and a beautiful stone fireplace. Put me in that rocker with a cup of tea, a fire and I would be a happy camper. The huge twig chandelier is perfect for this room. 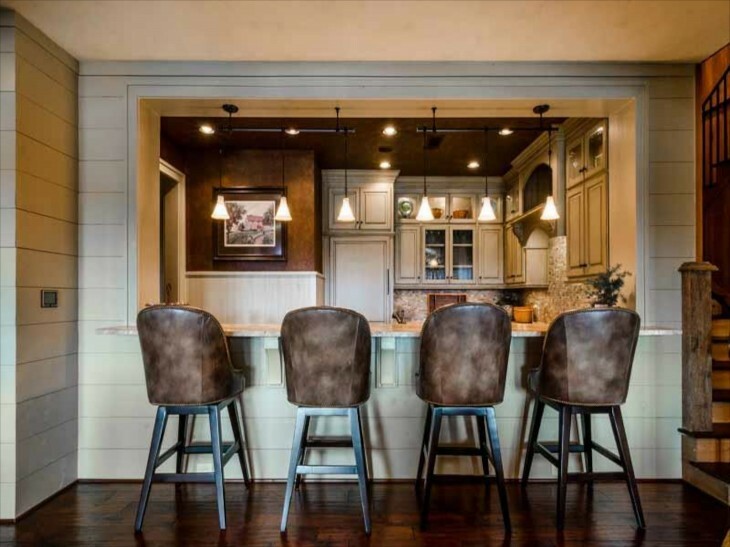 Here the terrace level kitchen is done in a light color with an antique wash against a rich chocolate wall color. I think I might have chosen a different set of counter chairs, but I bet these are probably comfortable and easy to clean. 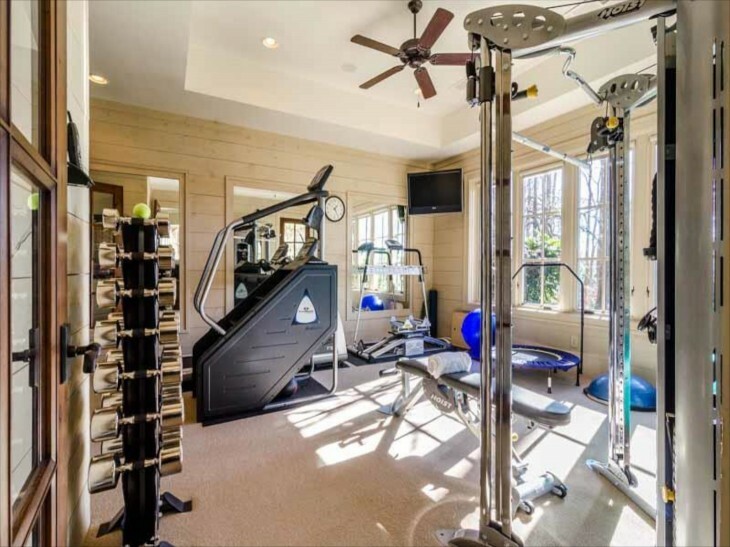 I think you have to be very self motivated to work out by yourself at home no matter how convenient it is to have it a home gym. Here they smartly kept this room bright. From this view of the back of the house you can pick out several of the rooms we looked at above. 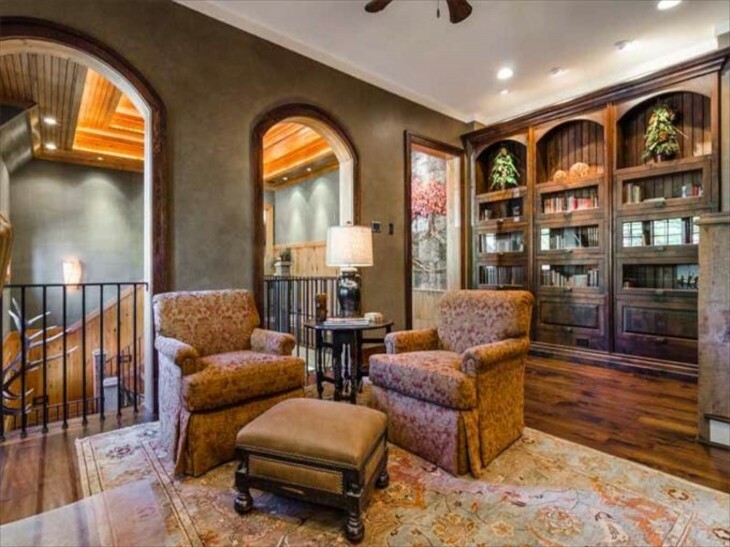 Beautiful architectural details in this home. The multiple clay chimney pots add so much. Notice that the terrace level trim color is darker than the upper floors. This choice really grounds the house to the land. The little bit of green stained shingle trim in the gables adds even more interest. What you will see in the next photo might surprise you. 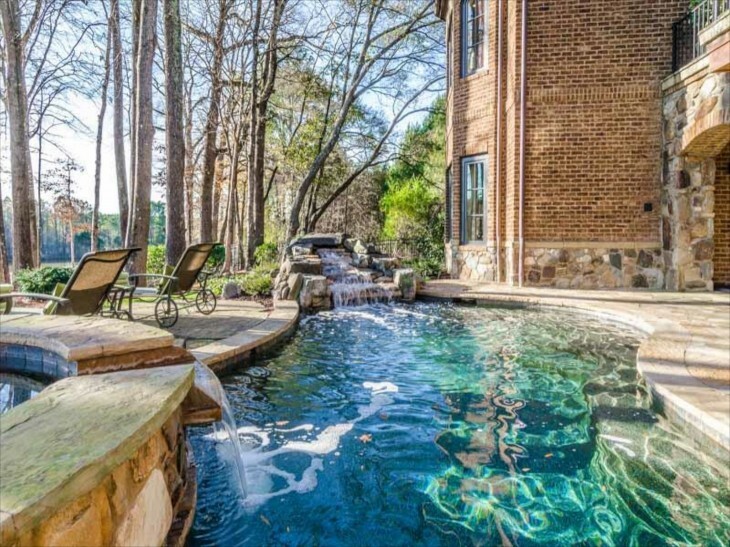 From the photo above you might never have guessed that there is a beautiful swimming pool and waterfall. The use of boulders and stone masks the edges of the pool. 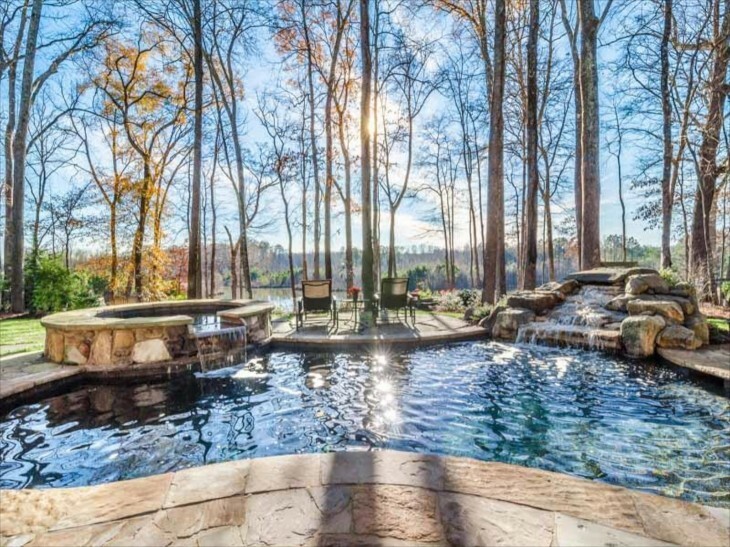 The view from the house looking out reveals the pool’s details. 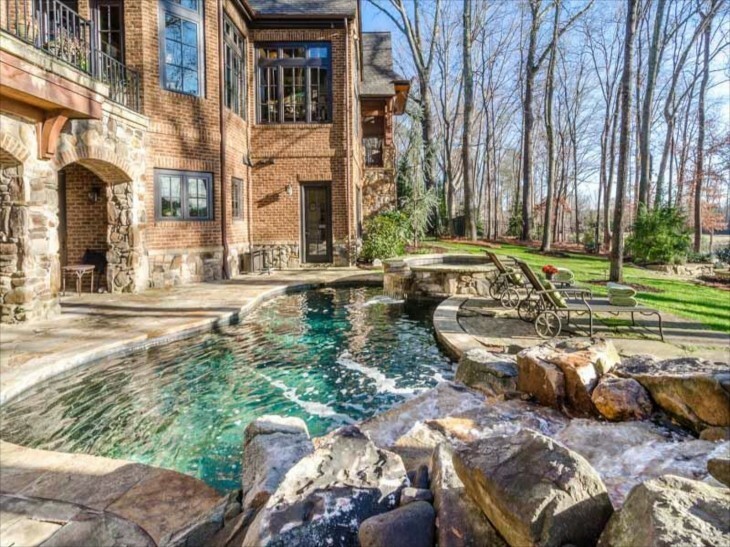 The builders did a beautiful job of making this pool area and patio seem almost like it has always been here and the house was built around this feature. Any movement of water such as in a small waterfall, can make sitting outside a wonderfully peaceful and relaxing experience. 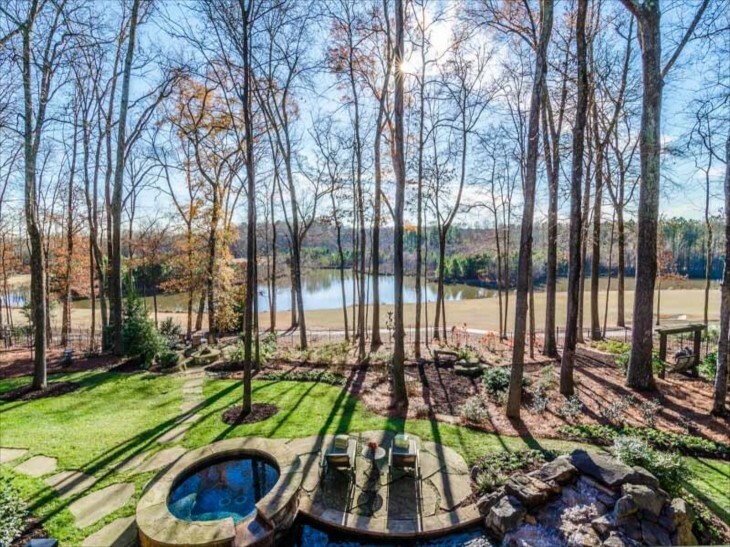 Here we can see a longer view that includes a large pond. I have to say, I did not immediately realize that the area behind the trees and in front of the pond is a fairway for the golf course. Nicely done Mr. Norman. 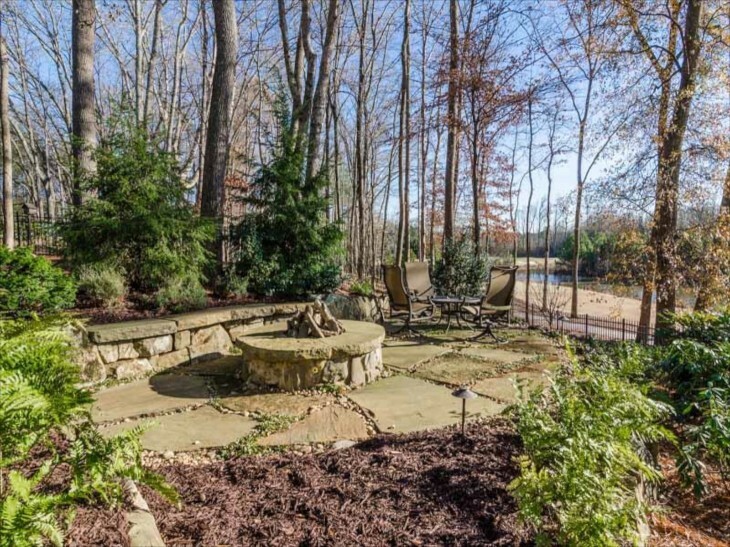 The yard is fenced, and also includes a fire pit. Plenty of seating along the stone wall. A view of the club house and more of the golf course where it again looks like the natural contours and vegetation helped to create the golf course that looks like it belongs.